Mie Prefecture (三重県, Mie-ken) is a prefecture of Japan which is part of the Kinki and Chūbu regions on Honshū island. The capital is the city of Tsu. Evidence of human habitation in Mie can be dated to more than 10,000 years ago. During the Jōmon and Yayoi periods, agricultural communities began to form along the river and coastal areas of the region. Ise Shrine is said to have been established during the Yayoi period, and in the 7th century the Saikū Imperial Residence was built in what is now Meiwa Town to serve as both a residence and administrive centre for the Saiō, an Imperial Princess who served as High Priestess of Ise Shrine. Mie Prefecture forms the eastern part of the Kii Peninsula, and is bordered by Aichi, Gifu, Shiga, Kyoto, Nara, and Wakayama. It is considered to be a part of both the Chūbu and the Kinki regions due to its geographical proximity to Aichi Prefecture and its cultural influence from Kinki, such as the fact that Kansai dialect is spoken in Mie. Traditionally, though, the Iga region of Mie is considered to have always been a part of Kansai. Mie Prefecture has traditionally been a link between east and west Japan, thanks largely to the Tokaido and Ise Pilgrimage Roads. Traditional handicrafts such as Iga Braid, Yokkaichi Banko Pottery, Suzuka Ink, Iga Pottery and Ise Katagami flourished. With 65% of the prefecture consisting of forests and with over 1,000 km of coastline, Mie has a long been associated with forestry and seafood industries. As well as this, Mie produces tea, beef, cultured pearls and fruit, mainly mandarin oranges. The goddess of agriculture and industry in the Shinto religion. At the Gegu 下宮 in Ise. World Heritage Site. Ancient road in southern Mie once used by pilgrims. with dried radish, carrots, lotus roots, konnyaku, shiitake, taro roots and stems, fried in oil and soy sauce, with sweet vinegar as seasoning. Made for family festivals. It tasts quite crunchy and good with vinegar. and other amago dishes アマゴ料理. It is a speciality of Tsu city and 美杉町. WASHOKU : arame 荒布 Eisenia bicyclis. You shovel a good portion in a large bowl, add some sugar and then poor green tea over it. They get funyafunja soft. An expensive delicacy at Ise Shrine. sushi with "pickled" fish in soy sauce marinade, to make it look like the color of tortoiseshell Bernstein. bora no heso ぼらのへそ "navel of the springer"
Actually, it is the stomach prepared to eat. Often barbequed. after eating fried or boiled fish, tea (or simply hot water) is poored over the bones, head and other leftovers, which are carefully washed with the liquid. This is then slurped out of the plate. Or poored over rice and eaten. This is very healthy, called "isha shirazu 医者知らず" or "isha koroshi　医者殺し", no need for a doctor. They were prepared during the rice field planting season and put as offerings for the deities on the side of the fields. Here you see a woman praying for a bountiful harvest. 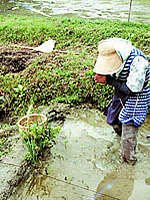 Shima is one of the foremost producers of hijiki in Japan. They are prepared in many ways. rather thick and round, the skin is thick. Made since the end of the Meiji period. Ise udon　伊勢うどん　... see menrui, udon. served at （伊勢神宮）Shrine Ise Jingu to the pilgrims. Senbei with a "stamp like a thread"
Made by Hadaya Shop 播田屋, who owns three old metal stamps. They are specially soft and made with a stamp (in) from olden times. The imperial family likes to eat them on their round to Ise shrine. There are only 7 senbei in one pack, since the time when Meiji tennoo could only eat 7 out of a pack with 10. The oysters are boiled together with the rice in the same pot. The fish is marinaged in soy sauce. Served with ginger and nori. At the estuaries of the rivers Kisogawa, Naragawa and Machiyagawa 町屋川. It is put on hot mugimeshi rice. A mix between chazuke and salad. The soup has a miso taste. This fish is caught in Eastern Kishu. Eaten as sashimi, in vinegar, as sukiyaki. Even the intestines (kowata コワタ（腸）are dried and eaten. Manbo (Mambo) is also eaten in Miyagi prefecture. Mie is famous for more than 15 different kinds of manjuu dumplings. They were prepared by the various tea shops in front of the Ise Shrine and people would buy them as presents nowadays.
. . . CLICK here for Photos : manju from Mie ! The Manju Road leads from Ise shrine. There are other Manju Roads in Japan too, for example one in Nagasaki. The moroheya powder is mixed with the wheat flour for making green noodles. Very old dish of the Ise region. Mochi are made with anko and yomogi, rolled in kinako soy flour. This was only prepared on auspicious situtations and the mochi were given to the neighbours and friends. sea cucumber is also eaten in other dishes, often for New Year. In Mie, apart from fish, sazae turban shell is used. Prepared in May and June. oojiki jiru 大敷き汁 "soup after a good catch"
miso-based soup with the fresh catch. Saba, ika, katsuo, aji, sometimes even Ise lobsters. Prepared one month later than the normal Boy's festival, on June 5, and for the girls. usual dish for obento lunch boxes and for the evening drink. Near Yunoyama onsen hot spring is the temple of the Tendai sect, 三岳寺, where the monks function as soldiers too and need some stamina. There are even pork bones used for broth, then radish, carrots, Konnyaku, lotus roots, taro and yam, bamboo shoots and even wild boar meat are used. They are very large, about 5 time the contents of a normal dumpling. They are fried and eaten without sauce. from Tsu town. In Tsu most of the eel in all of Japan is eaten. watarikaki 渡利牡蠣（わたりかき）Oysters from the Kihoku　紀北町 region. It is almost a sweet water lake with an underlying current of sea water. Commercial oysters are produced since the Showa period.They have a juicy taste. This is as a result of its production in the nutrient-rich water of the local Funatsu River and Sea of Kumano. They are lowered to salt water after a typhoon or great rain, when the river brings lots of nutrition for the oysters. Later they are put in a higher position of the fresh water of lake Shiraishiko 白石湖. So the oyster farmers are quite budsy checking the saltiness of the lake water. Taken out of the water, they keep fresh for about 5 days if they are not opened. The oysters are eaten fried or raw, but also in soup (kakijiru　牡蠣汁) or on sushi rice with a bit of hot mustard (kakizushi 牡蠣寿司 ). ***** . Folk Toys from Mie .